Hilary Swank is an American actress, two-time Oscar, and Golden Globe Winner. The actress became well-known after filming in the famous films Boys Don't Cry and Million Dollar Baby. Hilary Swank was born in the state of Nebraska, where the actress’s hometown of Lincoln is located. But the future star spent her childhood in Bellingham, Washington. There was also an older brother, James, in the family. In elementary school, the girl began attending a theater group and, at the age of nine, appeared as Mowgli in the play The Jungle Book. Swank was also a sports lover because the girl went to the pool and rhythmic gymnastics school. When Hilary was in high school, the girl's parents divorced. Hilary moved together with her mother to Los Angeles, where a small family rented an old trailer and lived there for a long time. In the cultural capital of California, Swank's love for theatre productions turned into something significant. The girl began to play bit roles in television shows and gradually achieved the opportunity to shoot in feature films. After participation in the youth series Growing Pains, Evening Shade, Harry and the Hendersons, and Buffy the Vampire Slayer, Hilary Swank got a role in the full-length teen martial arts drama The Next Karate Kid. The girl did not reach great heights, but Hilary continued to film. The most popular series of that time in Hilary's career was the youth melodrama Beverly Hills, 90210, where the girl portrayed a single mother. The actress was dissatisfied with this role, but what is more important is that Kimberly Pierce, the director of the social drama Boys Don't Cry, noticed the girl. In this film, Swank was offered to play an unusual heroine, Brandon Teena, who was actually a man. The drama film about the transvestite caused a stir, and the actress won the first Oscar Award, as well as the Golden Globe Award. Moreover, Premiere magazine called the role of Brandon Teena one of the hundred greatest movie performances of all time. At the same time, the actress’s height of 168 cm does not correspond to the average height of an adult male. But her somehow rugged features and the fact that the actress does not fear to look “not like everyone else” brought Hilary an overwhelming success. However, the actress was also included in the list of actors called "Too Ugly" for Hollywood. There were also Bjork, Javier Bardem, Tilda Swinton, and Benedict Cumberbatch. However, she had also other problems with the appearance. In 2012, the actress complained to the press that she was regularly confused with her colleague Jennifer Garner. One more Swank’s starring work was the sports drama Million Dollar Baby. The actress won the Oscar, Golden Globe, as well as the Screen Actors Guild Awards for this film. Clint Eastwood and Morgan Freeman were her partners in the movie. 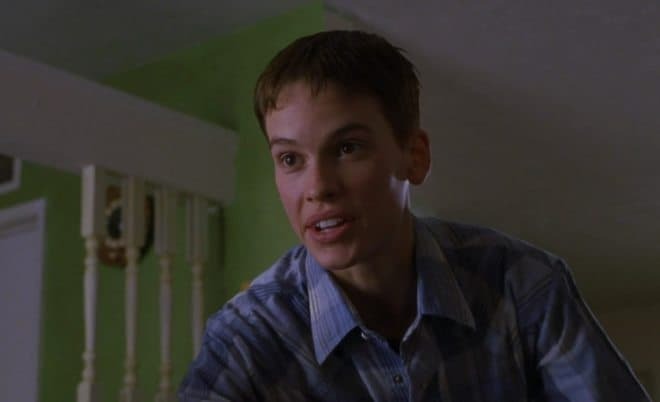 Hilary Swank played a leading role in this movie. The actress’s heroine is waitress Maggie, who comes to the boxing training. Despite the refusal of the coach, the girl shows a talent for boxing and tremendous perseverance. As a result, Maggie quickly begins to fight and even reaches the world title final. Million Dollar Baby is not an average sports film about great achievements, training and a long-awaited victory, it is a serious drama that also won an Oscar for the Best Picture, so the championship fight is just the beginning of a series of tragic events. For the role in the film Iron Jawed Angels, Hilary Swank was nominated for the Golden Globe and the Screen Actors Guild Awards, but she did not win them. The actress was nominated for the Screen Actors Guild Awards once again for the film Conviction, but the result was the same. In this drama, Hilary Swank played a sister of a killer who was sentenced to life in prison. The girl does not believe in the guilt of her brother and has been trying to find evidence of this for years, becoming a lawyer, and also collecting evidence and preparing to challenge the verdict. Besides these outstanding projects, there are exciting movies in the filmography of the actress, for example, the thriller Insomnia, the historical film The Affair of the Necklace, the melodrama P. S. I Love You, the religious-mystical film The Reaping. The biographical film Freedom Writers, the thriller film The Resident and the film Amelia about the life of the American national heroine, Amelia Earhart, are also worth mentioning. The last movies before the break in the actress’s acting career were the social drama Mary and Martha, the western film The Homesman, the melodrama You're Not You and the TV series The One Percent. In 2015, Hilary took indefinite leave for family reasons. In the autumn of 1997, Hilary Swank married a colleague, actor Chad Lowe. The actors did not know each other for a long time. The young people met on the set of the film Quiet Days in Hollywood a few months before. Family relationships lasted about eight years, then the couple divorced. They did not have children in this marriage. Shortly after the breakup with Chad Lowe, the actress had a romantic relationship with her agent, John Campisi. The lovers even lived together, but, finally, they ended this relationship. Now, Hilary is not married. In May 2015, there was new information about the actress's personal life in the press. Hilary Swank began dating a former tennis player, and now a financial consultant, Ruben Torres. The couple confirmed these rumors, and in March 2016, Hilary and Ruben even announced their engagement. Nevertheless, in the summer of the same year, the lovers separated. In 2015, Swank announced a temporary leave, as her father underwent the complicated lung transplant operation, and Hilary decided to devote her time to him. Hilary had toured around the world before this break. She was in Russia, where she performed in Grozny in 2011 at a concert dedicated to the birthday of Ramzan Kadyrov. International human rights organizations warned the actress about the negative consequences of this act, but Hilary decided to speak. Later, the actress’s actions were followed by a storm of criticism. As a result, the actress said that she was unaware that human rights were systematically violated in Chechnya, regretted her words for the head of this region, and donated all fees to charity. Since 2004, Hilary has been the face of the Calvin Klein Sensual Support collection of women's clothing. The actress has a popular Instagram account with half a million subscribers. The service verified her page. On Instagram, the actress regularly posts photos of training, beautiful landscapes, and dogs. It is known that the actress likes these animals. Hilary donates money to dog shelters, participates in dog adoption campaigns and other events that help homeless animals, and even travels around the world to help dog shelters abroad. The actress also has two dogs, and Hilary hardly leaves the house without them. They are the Jack Russell Terrier, Karoo, taken by the actress on the street, and the Golden Retriever Mixed Breed, Rumi, adopted from the dog shelter. In the summer of 2017, fans of the actress breathed a sigh of satisfaction. After a two-year leave, the actress appeared on the screens, although it was a bit role. In August 2017, the crime comedy Logan Lucky was released. It tells about two brothers who plan a robbery in the state of North Carolina, where the famous NASCAR races are organized. 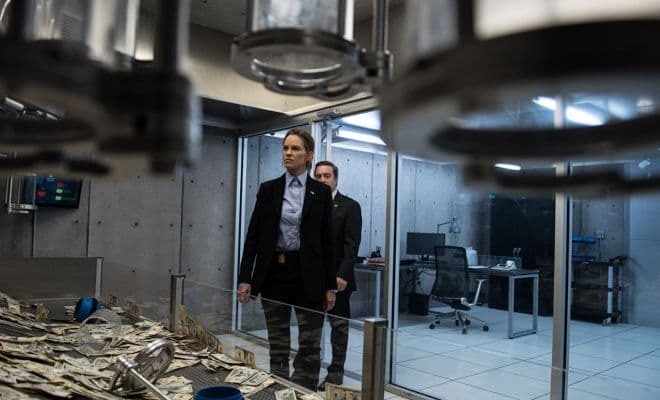 Hilary Swank played the role of Special Agent Sarah Grayson.